Can be found near lava pools. The ss breed is the perfect counter for MPD. At 341 it's faster than the MPD. 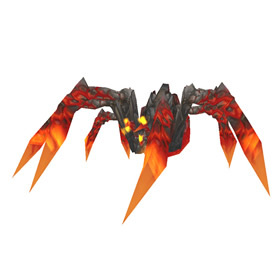 Use web so they can't change pets, magma wave to get rid of decoy, then kill with burn. If you are looking to maximise the capability of this pet, you need breed 18. She heals like mad, so total health means very little. If you go for breed 15, many times you will be healing before you took any damage (wasting the heals). The idea is to maximise the damage output, and healing of the pet... both of which are based on your Power. The breed with the highest power is the P/S (18) breed, and thus will heal for more than most pets can damage in a round. I used this as my main fighter while I tamed every rare at level 90, swapping to Magical Crawdad if I found a blue to tame. This solos any standard pet battle team in the game, without complex conditions. A 4 round loop of 'Brittle Webbing, Leech life, Cauterize, Leech life', slow and sure. There are harder hitting pets, there are bigger healers, but this little pet combines both in such a way that with few exceptions, you can run with a levelling pet and a taming pet reliably. they do not seem to come up as secondary to the crabs, or any other pet in the zone. also, battling/killing crabs does not seem to help them spawn quicker, seems after i captured a common one and killed a few other grey ones, they quit spawning very much, so i waited 30 mins and tried again (vs. roaming all the lava pits over and over) and a few more spawned...seems it takes time. I caught mine in a laval pool sitting alone, it was in the afternoon server time on Kargath in the Sea of Cinders. I was lucky enough to get a rare s/s. When leveling her I had up leech life, cauterize, and brittle webbing. At level 22, when fighting aquatics she could solo a group of 24-25 aquatics. I know that my set up for her abilities means slightly slower battles, but she's tough. At level 25 she has been able to solo Wise Mari. I really like this pet. Primary only, shares spawn points with Lava Crab. Spawn is at any time of day/night. Do these ever show up as a secondary? Found two poors at 57.5 76.8 at 1125 am EDT and Zangarmarsh time 925am. Left them for someone else, since I have a poor quality one. This is in The Sea of Cinderss in Searing Gorge. Good luck, everyone! This pet is an excellent damage dealer and self-healer. Leech Life does work with Brittle Webbing, so you can use it alongside Cauterize for tough enemies. When you just want to kill pets quickly though, swap out Leech Life for Burn. http://www.youtube.com/watch?v=G5WiKEwozD8, My video of one of these fully realized. Okay server Cenarius server time 1:28 am. Found my uncommon in the center of the large pit in the middle....I need to mention this. 2 hours ago I literally flew around killed every lava crab I could for a while and nothing.... I left to another area and got some other common pets I was missing...Came BACK here and Searing Gorge had them literally everywhere....I had to kill a few to get an uncommon. Found one by chance and it was poor. Decided to try for a rare when I had time, but then I got a stone to upgrade him. Very happy with that! He is my next project and his healing abilities make him amazingly durable. I think he'll be partying with my Spirit of Competition soon in my rotation. From the battle side I would say that breed 15 is the best choice for your spider. If you're going for all secondary spells, then beeing faster is absolutly necessary, because you will web ur enemy before he has done an attack this round which means he will get hit by the net if he attacks. If ur are slower, then he will receive the first hit from this spell next round. If ur faster, cauterize/leech life will heal you before you can be killed on low health. The spawn of this guy seems very strange. I hunted him for hours starting at around 6 or 7 pm server time and I'd go to each of the spawn locations, take out all of the lava crabs (battle pet or normal critters) and then fly on. I did this for at least 2 hours and only came across 3 molten hatchlings the whole time. I then gave up for a while, came back 15 minutes later and there were at least 4 spawns. It's almost as though killing the lava crabs limited their spawn. My lastest leveling project. I have an idea of sporting this dude with 5 breed or 8 (what I have now) against humanoids. Utilizing Leech Life, Cauterize and Brittle Webbing. It's a max healing combo I know.. just curious how it would work. :) ...if anyone has a 20+ lvl one give a shout out how that worked if you have tried. it could (in my own mind at least) be viable against critters (lack of flayer lol) and humanoids. Got mine in Searing Gorge in a lava pool (at 36, 77) around 11:00am (server time. Lucked out, rare first time. Why is it some pet's "rare"s are so much rarer than others? I've been farming 3 other area pets and can find them by the dozens but only as poor, but first hatchling I find and I'm done… back to farming I guess. These blisteringly hot spiders camouflage themselves by blending in with oozing magma.